CD review: "What About Love?" Deborah Coleman has passed comfortably from curiosity to icon. As one of the first guitar-slinging African-American women blues singers, Coleman got a lot of attention early in her career as much for her willingness to challenge stereotypes as for her playing and singing. Today, with six albums and innumerable shows under her belt, Coleman no longer needs to rely on anything other than her music for attention. Especially as good as her music is. 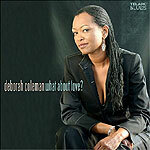 On her seventh album, and her first for Telarc, Coleman shows why she is consistently one of the top draws on the blues circuit. Possessed of a warm singing voice (not so different from Robert Cray's), an incisive tone on guitar similar to Albert Collins', and the ability to write gorgeous hook-filled contemporary blues, Coleman is quite simply the goods. Like Cray, Coleman comes to the blues from a rock and pop sensibility. So while blues purists may not take to her (at least not any more than they do Cray), her straddling of the blues-rock border allows her to appeal to an audience far beyond the blues world. But anyone who is drawn to good songwriting, to solid musicianship, to top-drawer singing will like the sounds on "What About Love?" Coleman wrote four of the 11 tracks here, alongside covers of songs by blues phenom Ellis Hooks, Texas legend Delbert McClinton and the Everlys' "When Will I Be Loved?" But all of them become Coleman songs in her hands: the slowly loping beat; the soft, almost spoken vocals; the cutting, jangling guitar solos all combine to create a sound that is uniquely, recognizably Coleman's.